The FBI are doing all they can to stop. the rise in organized crime in Liberty City. They also want to increase their funding.."
FIB logo in the GTA IV Era. 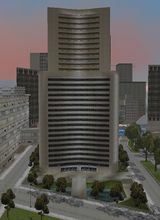 The Federal Bureau of Investigation (FBI) in the GTA III Era or Federal Investigation Bureau (FIB) from the GTA IV Era onwards, is based off the real life FBI law enforcement agency. FBI logo in GTA III. The FBI is the third level of law enforcement that pursues the player. The FBI will appear only when the player's wanted level reaches five stars, before the Army on six stars. FBI Agents wear blue jackets with "FBI" printed on the back in nearly all of the GTA III era games (Excluding GTA III itself). In Grand Theft Auto: Vice City Stories they wear black vests over gray t-shirts with "FBI" printed on the back with dark glasses. The FBI agents are well armed in all appearances, and their vehicles are generally extremely fast. The FBI comes four agents in each car, and since they are well armed and very accurate, they will kill the player extremely quick if they have an open range. They carry MP5 in all of the GTA III era games except for Grand Theft Auto III where this weapon is unavailable and instead they carry AK-47s and will also drop pistols if killed. Also, in GTA III, when arresting the player or chasing the player at a one-star wanted level and the player is on top of a vehicle, the FBI will use pistols. FBI agents also appear in some missions, notably Martha's Mug Shot, where they act as protection for Alex Shrub and will be sent to kill the player once he successfully photographs Candy Suxxx and Shrub together three times. The FBI agents in this mission are armed with Uz-Is and if attacked, will cause the police radio to call out the same 10-codes as when civilians or gang members are attacked (e.g. 10-19 when they are shot, same with regular civilians). Also, they guard the InterGlobal Studios, but strangely with regular Ranchers instead of the usual FBI Ranchers. In Liberty City, the FBI headquarters and offices are located in Torrington, Staunton Island, to the left of the headquarters of the Liberty City Police Department. In the HD Universe, the agency is known as the Federal Investigation Bureau (FIB), presumably to avoid conflict with the real-life FBI. The name is also a play on words, since fib is a synonym of lie. In-universe, characters do not pronounce the acronym as one word; instead, each letter is pronounced individually. As the wanted level system changed in GTA IV, they now appear at four stars, sometimes along with NOOSE to assist the LCPD, and more heavily at five and six, and will expertly drive and doggedly follow the player. They now drive FIB Buffaloes with four agents to a car. Meeting a FIB Buffalo on the road is particularly dangerous: the car is the fastest law enforcement vehicle in the game, the driver relentlessly pursues the player and attempts to ram the player whenever possible, and its three passengers are armed with SMGs. This combination can make short work of a player's getaway vehicle if the player does not act accordingly. On foot, agents are typically armed with Carbine Rifles, although some agents carry Pump Shotguns and SMGs instead. Additionally in The Ballad of Gay Tony, agents carry the Automatic Shotgun and the Assault SMG. FIB agents appear to be more accurate than NOOSE's Tactical Response officers; however, FIB agents are more susceptible to being shot. Unlike the LCPD and NOOSE, both of which employ young to middle-aged Caucasian, African American, and Hispanic officers, the FIB is solely employed by late middle-aged Caucasian men. They use different types of uniforms; some agents wear random clothes with navy blue jackets jackets with "FIB" printed in black letters on their backs with an eagle design. Other agents wear random clothes with their distinctive blue track jackets with "FIB" printed in black letters on the back and on sleeves. Other agents wear black suit pants with a white shirt and a black combat vest and a badge around their neck reading "FIB". All agents carry their FIB badges on the neck. In GTA IV, when the player reaches a certain level, he/she unlocks a "FIB" hat for their multiplayer avatar. In the The Lost and Damned missions Bad Cop Drop and Politics, and in the The Ballad of Gay Tony mission Going Deep, the agents employed are of African American, Caucasian and Asian descent, and wear different apparel, such as suits and ties, overcoats, blue FIB track coats, and others who where a tactical vest with the letters "FIB" printed in yellow on the front and the back. In Grand Theft Auto: Chinatown Wars, the agency is dispatched when the player attains a 4-star wanted level. Instead of driving FIB Buffaloes, they drive black FIB Ranchers (which looks like the Cavalcade with modified headlights and grilles). Despite law enforcement vehicles don't usually skillfully chase the player, or even follow at all at high speeds, the FIB can be easily evaded due to their slow FIB Ranchers. However, unless the player gets rid of his wanted stars, there will be just more FIB Ranchers spawning in front after they're evaded. On foot, agents carry Micro SMG (same weapon as NOOSE in GTA Chinatown Wars). The agents attacks the player similar ways as NOOSE does, except with more gun fire. One of the three protagonists in Grand Theft Auto V, Michael De Santa is known to be in the FIB witness protection program. Despite his past, he has made a back room deal with the FIB which allows him to keep the money he gained illegally from robbing banks. When Michael and his protege Franklin Clinton rob the Vangelico jewelry store, Michael's FIB contact Dave Norton warns him that the incident would attract Trevor Philips' attention. Indeed, Trevor shows up unexpectedly at Michael's house, forcing Michael to call Agent Norton on how to handle the situation. Michael, Franklin, and Trevor are then forced to help Agent Norton and his superior Steve Haines in the agency's covert operations, usually against the IAA. When the player attains a wanted level of four or five stars, FIB SUVs are dispatched. The FIB SUV has two NOOSE agents armed with pistols, hanging on both sides of the SUV. The FBI in GTA Vice City Stories seem to be the most hostile in the GTA III era as their blockades will instantly blow up or heavily damage your car on sight. The best way to maneuver through a blockade is to get a bullet-proof car. The 5 star wanted level is considered by many to be the most difficult in the GTA III era, because the FBI vehicles are very fast, always contain 4 officers and they use strong weapons, as opposed to the military, whose vehicles are quite slow, and hold only 2 or 1 occupants. The only real dangers are their stronger weapons and the run-overs by the Rhinos. The FBI in GTA III are one of the only law enforcement to wield assault rifles, the other ones being the military at Fort Baxter who have M4s. The FBI vehicle in GTA Vice City Stories is the only one in all of the GTA series to be colored white. The FBI in the iOS and Android versions of GTA III are renamed to FIB, a nod to the HD Universe. Strange enough, they still introduce themselves as FBI agents (e.g. “F.B.I.! Stop!”, “This is the F.B.I. !”, etc. ), and the FBI Car is still named Fbi Car in-game instead of FIB Car. For reasons unknown, FIB Agents will never taunt at the player in GTA IV, unlike other law enforcement. FBI beta in GTA III. A closeup on the FIB agents in GTA IV. FIB agents in The Ballad Of Gay Tony. An FBI Car in GTA III. An FBI Rancher in GTA Vice City. An FBI Washington in GTA Vice City. An FBI Rancher in GTA San Andreas. An FBI Truck in GTA San Andreas. An FBI Cruiser in GTA Liberty City Stories. An FBI Rancher in GTA Vice City Stories. An FBI Washington in GTA Vice City Stories. An FIB Buffalo in GTA IV. An FIB Rancher in GTA Chinatown Wars. French Secret Service, the French equivalent. This page was last modified on 16 June 2018, at 03:41.